The Space-Terrestrial Internetworking (STINT) Workshops addresses emerging technical topics related to data exchange between and amongst space-based and terrestrial network nodes. Such communications systems accept space assets as first-class nodes performing common network functions including stateful packet inspection, routing, management, and security. Bringing together some of the most influential members of the field of data transfer between space and terrestrial nodes via delay-tolerant networks with time-varying topologies, STINT seeks contributions with a clear focus on packetized, multi-path, and multi-hop data exchange between and among space-based and terrestrial (plus planetary) network nodes. Fundamental Research (STINT-FR): The fundamental research version of the workshop focuses on efforts discussing the solution of general, theoretical problems. STINT-FR will be held in Nanjing University under the name 6th International Workshop on Space-Terrestrial Internetworking (STINT Summer 2019). Applied Research (STINT-AR) The applied research version of the workshop focuses on efforts discussing the solution of specific, practical problems. 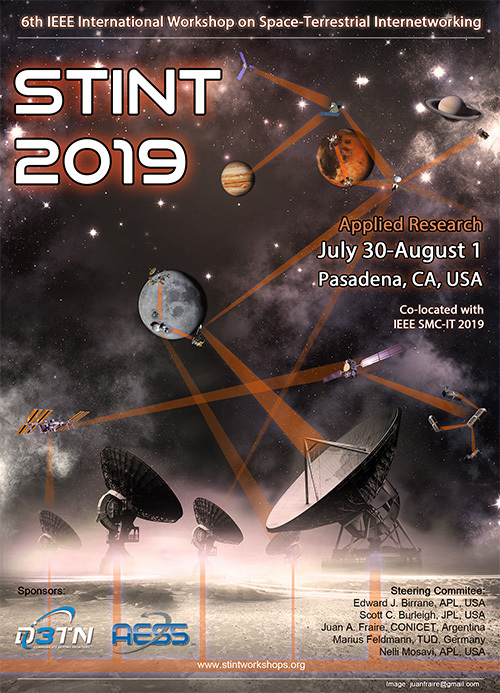 STINT-AR will be held at the 2019 IEEE International Conference on Space Mission Challenges for Information Technology (SMC-IT), in Pasadena, CA, USA.